Maax Spas Industries Corp., in Chandler, Ariz., has recalled approximately 1200 hot tubs and swim spas after reports of the ultraviolet (UV) generator inside the units igniting while in use, posing a fire hazard. The Milan, Treasure Garden’s latest outdoor umbrella design, takes inspiration from the designer runways of Europe from which it takes its name. After years of being an afterthought, outdoor furniture has become a priority for homeowners looking to create their own personal oasis at home. The ability to entertain in a stylish backyard is now as important as having a top-of-the-line kitchen or large ensuite bathroom. Rona issues recall on patio dining set which could be affected by an assembly defect that could result in broken chair legs, which present a fall hazard for consumers. Rona, a banner of Lowe’s Canada, headquartered in Boucherville, Que., is issuing a voluntary recall on the grey Marroco patio set. 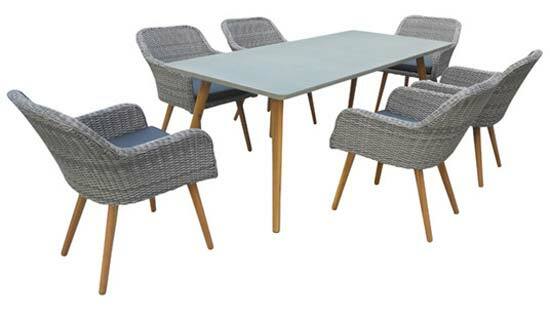 The set includes a rectangular table with a cement fibre top and wooden legs, with six chairs. According to Health Canada, the product could be affected by an assembly defect that could result in broken chair legs, which present a fall hazard for consumers. The product was sold between February 2018 and May 2018 in Rona stores across Canada. Customers who purchased this product should stop using the furniture and return the entire set to a Rona store for reimbursement. Approximately 84 units were sold in Canada and, as of May 28, the company has received one report where a chair leg broke; however, no injuries were reported. We have purchased a marrroco patio table but it was missing all 4 legs. I am willing to buy them I just need to know where. Thank-you. Dreaming of a better backyard? Sign-up for your account with POOLS, SPAS & PATIOS and make it happen.